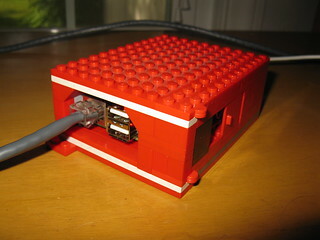 I built a LEGO case for my Raspberry Pi computer. It was blogged by The Brothers Brick. 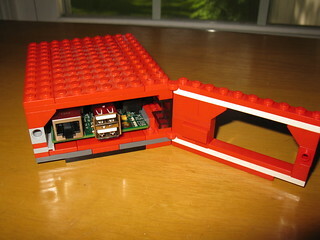 A functional difference between this and other LEGO Pi cases I’ve seen is that mine is designed so that the Raspberry Pi’s circuit board slots directly into “rails” and is held securely in place when the hatch is closed, yet it can be easily removed by opening the hatch and sliding it out. No part of the Pi contacts the case except the very edges. Posted on Tuesday, June 11th, 2013. I had a half-baked plan to sell instructions for new models you could build with pieces from specific LEGO sets. The name I came up with for this project was Brick Blueprint, which I mentioned here a couple times last year before deciding to shelve the idea. Earlier this summer, I revived the idea and built a storefront using Shopify and FetchApp. 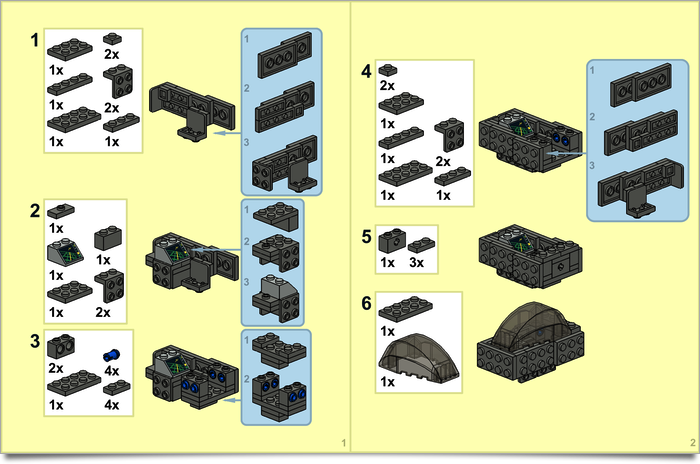 I created a “blueprint”-inspired instructions template and worked out a streamlined pipeline to produce the instructions, from bricks to LDraw files to final PDFs. I designed a bunch of models. There was a Twitter account, too. Marketing is no fun, though – and more to the point, store hosting isn’t cheap when you’re bootstrapping sales from zero. So, after a midsummer hiatus, I decided this is not how I would make my first million. The store has been put on ice and the instructions have been posted to Flickr. Here are the twenty-six sample models I produced. These are free. Play well! Links to the LDraw files for each model are available from the image pages. As conceived, Brick Blueprint may not have been commercially viable, but I did learn some useful things such as how to set up a functional web store and how Google AdWords works from an advertiser’s perspective. I learned some new tricks for my favorite LDraw tools. Last but not least, I put together this nice little portfolio of pocket-size models built with a highly limited palette of parts. LEGO, hire me! Posted on Thursday, August 30th, 2012. I’ve airlocked a couple LEGO-related scripts that had been lingering in stowage. They received little traffic, and had in fact been inoperable for some time without generating any complaints. 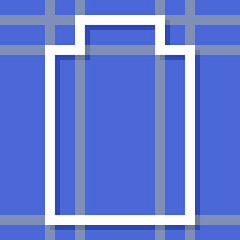 Bitsticker converted bitmap images to LDraw “sticker” elements; Scott Wardlaw’s Sticker Generator is a viable replacement. To create text-based LDraw stickers, I recommend using Ross Crawford’s original txt2dat instead of the “txt2dat online” interface I created, now retired. Likewise, LDraw part authors should use Philo Hurbain’s original LDraw utilities instead of my “Isecalc online” script, also retired. With the cgi-bin hold cleared of such jetsam, the ship is leaner, meaner, and, practically speaking, more portable should I decide to change hosts or redesign the site. Previously, the domain was registered in my hosting company’s name. At the time of purchase it seemed a reasonable consequence of my hosting package, but it proved difficult to make configuration changes and unclear what would happen to the name in a variety of a scenarios (change of company ownership, lapsed payments, etc.). Now that is all squared away and telemetry indicates nominal domain name operation. End log. Stand by to resume standard content comm channel. Posted on Tuesday, August 21st, 2012. Instructions for a simple cockpit module you could build a little spaceship around. Posted on Friday, March 16th, 2012. 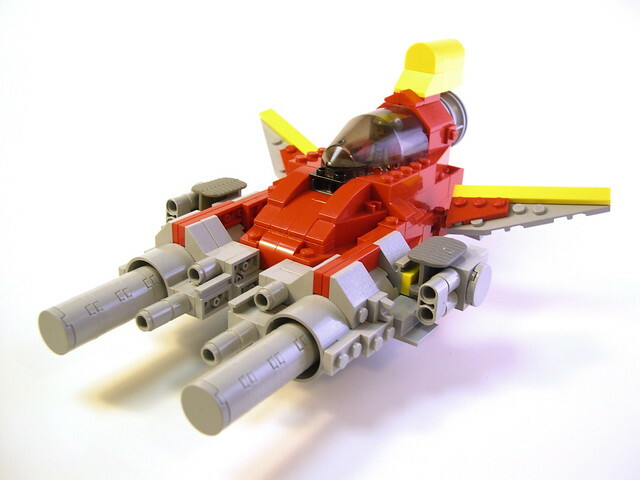 Here are a pair of LEGO starfighters I made last year. These are both Vic Vipers, a popular design loosely based on the player ship from a classic video game. Vic Vipers are characterized by two forward prongs, two rear wings, and a single vertical tail fin. I’m not quite sure why they’re so popular in the LEGO-verse, but I think part of the reason is that the template provides a creative constraint, like painting with a limited palette or engineering on a budget. Another creative constraint I like to employ when building models is to use pieces from only one or two sets. It helps you learn to see each piece as an elemental shape instead of a specific type of part with a fixed function. Draw what you see, not just a symbol for what you think you see. Also, strive to rationalize your most indulgent hobby as a valuable exercise in mental elasticity. Anyway, both ships were built in time for the annual “NoVVember” challenge. The second ship was built as a subtle but specific tribute to nnenn (Nate Nielson), a prolific and respected builder who died unexpectedly last year. The ship incorporates two instances of the funny quasi-part Nate used as his recognizable icon. So what sort of creative constraints do you work with, intentionally or otherwise? Can a cage become a scaffolding? As mentioned in my previous post, I recently drafted a new LDraw part in SketchUp. I converted that model to LDraw format with a script derived from su2ldraw. 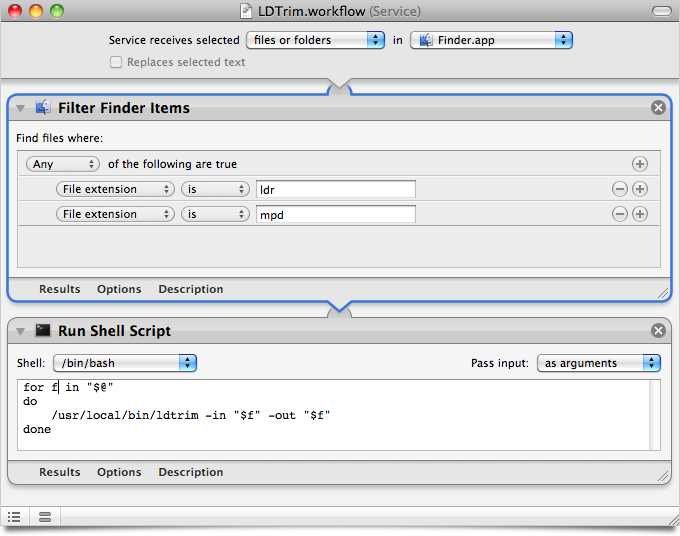 My version of the plugin is now available as ldraw_export.rb; you can get it here (now at GitHub). 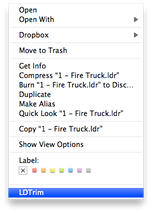 More details on installation and usage in the file itself. Brick Blueprints, a hobby venture. Build a bicycle. Tour some more. Further details as events warrant. 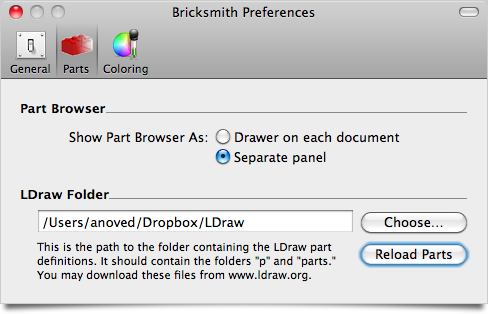 A common concern among LDraw users is how to add new parts to their libraries. Often, “in-progress” versions of desired parts are available in the LDraw.org Parts Tracker (get involved! ), but downloading and installing them manually can be tedious. If you don’t want to download every unofficial part, you can let LDView download and install the parts you want for you. It’s not yet in the official part library, but an unofficial version of 60475 is in the LDraw.org parts tracker. You can download the unofficial part and its prerequisites manually, or you can create a dummy model that requires it, and let LDView retrieve the files you. Here’s how. 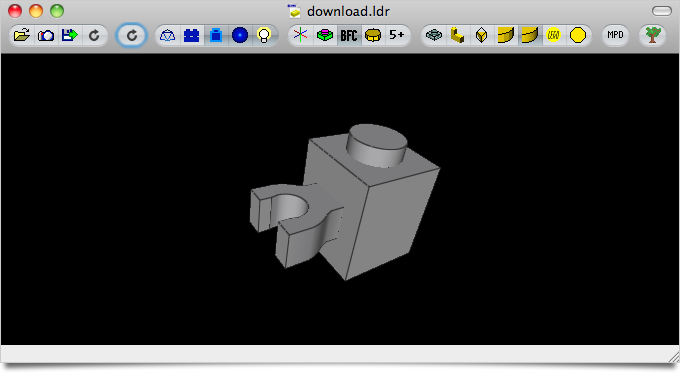 So, the point is that if you want to use a part that’s not yet in your library, just paste the part number in download.ldr, open it in LDView, and reload your parts library in Bricksmith. Posted on Saturday, April 24th, 2010. The screenshot above shows exactly how to set it up. So, if you’re cleaning up a lot of old LDraw files, now you can do it with nothing more than a right-click on the file or files of interest. Posted on Sunday, April 18th, 2010. I’ve started a Flickr group called LEGO Remix. 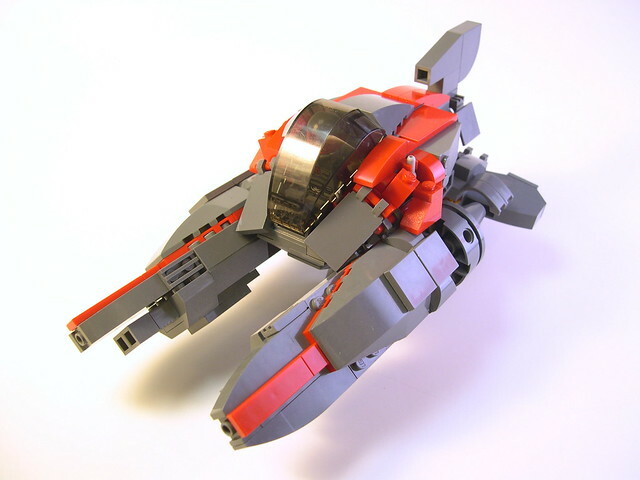 It is dedicated to the fine art of the alternate model – something original created with the pieces from an official LEGO set. You have to be frugal and creative with your parts usage to make a good alternate model. It’s my favorite building challenge. 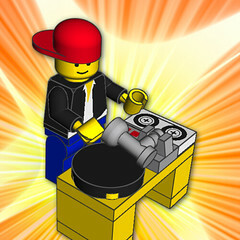 The LEGO Remix group is intended to encourage this aspect of the hobby. Posted on Tuesday, February 16th, 2010.